Jammu: He earned a masters in business administration (MBA) in Derbyshire and was flooded with job offers. But Gurmeet Singh Bajwa had other dreams. He has just been elected a sarpanch of a small village close to the Pakistan border. At age 28, Bajwa says this is what he is committed to: serve village folks still steeped in poverty and corruption. "At one point, my promise was to live up to the dream of my family who wanted me to make a mark abroad," Bajwa told IANS, speaking in a mixture of Punjabi, Engish and Hindi. "Now it is to serve my people." He added: "Individual excellence is nothing to working for society." The ongoing panchayat elections have produced another icon in Jammu and Kashmir in Bajwa, whose Kang village in the Ranbirsingh Pora belt lies on the international border with Pakistan. The young Sikh belongs to one of the most affluent and influential families of the region. His father is Trilok Singh Bajwa, a senior Peoples Democratic Party (PDP) leader and a former Rajya Sabha member. On May 17, voters decided they would give the younger Bajwa a chance to preside over their destinies. He polled 735 votes compared to his nearest rival, Karmajeet Singh, who got just 140 votes. Kang village has a mixed population of Sikhs and non-Sikhs, the majority of whom are Jats, a community spread over both Punjab and in the adjoining belt of Jammu. Before he contested the panchayat elections, Bajwa lived in the village, located only three kilometers from the Pakistan border. After early education in the Jammu region, he went to Britain in 2004. He returned to India in 2008 to help his father in the Jammu and Kashmir assembly elections. The elder Bajwa, however, lost. But why contest panchayat elections when Bajwa could have aimed high with his father's connections? "It's always a small step that paves way for a big one," Bajwa said. "I want to work for my people, serve them. And if I can serve them effectively, that would be a big step in itself." The villages in the border belt of Jammu and Kashmir have several peculiar problems: shortage of water to irrigate the fields, and recurring fights over water and land. The villagers on the border are also victims of the uneasy India-Pakistan relations. If and when guns boom, they have to retreat to their homes or even migrate to safe places, far away from their village, leaving their fields untended. Bajwa has already uncovered a huge problem: corruption. "The biggest problem I face here today is that almost 90 percent of the landlords have registered themselves as those belonging to BPL (Below Poverty Line) families," he said. "As a result, the deserving cases are suffering." He wants to reverse this and get justice done. "I shall work for the social uplift and justice to all sections; that's my aim," Bajwa said. "As of now my aim is to work for the people at the local level. Tomorrow, if there is an opportunity to serve at a bigger scale, I may do that. But that's all in the realm of tomorrow. "As of now, I want to work for the people in the village to make their tomorrow better." Said father Bajwa: "The people of the area compelled him, and he was more than willing to contest elections and work for the people." 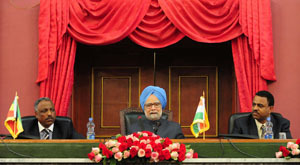 The Prime Minister, Dr. Manmohan Singh addressing the Joint Session of Ethiopian Parliament, in Addis Ababa, Ethiopia on May 26, 2011.